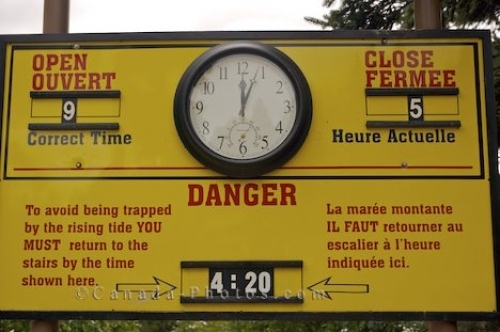 High tide can be very dangerous around Hopewell Rocks in the Bay of Fundy in New Brunswick, Canada and this large yellow sign with clocks alerts visitors of the time that they should be heading back. If you stay along the shores and explore for longer than the clocks recommend, you could easily get trapped by the rising tide. Sign and clock at the top of the stairs at Hopewell Rocks, Hopewell Cape, Shepody Bay, Chignecto Bay, Bay of Fundy, Albert, Highway 114, Fundy Coastal Drive, New Brunswick, Canada. Photo of the clocks at Hopewell Rocks in the Bay of Fundy in New Brunswick, Canada showing when the tide comes in.